Stewed pork and hominy float in a deep, richly flavored broth of spicy dried chiles for a staple of Mexican comfort food always found in authentic restaurants. Pozole is an ancient stew of the Aztecs and other Mesoamericans from the State of Guerrero that features nixtamalized maize or hominy, a staple of those cultures (pozole translates as “hominy”). As they believed the gods fashioned man out of masa, this dish of meat and maize was once held in religious reverence and even cannibalistic tradition until banned and pork was substituted for the flesh of prisoners. Today, it remains a ubiquitous holiday and celebratory meal. 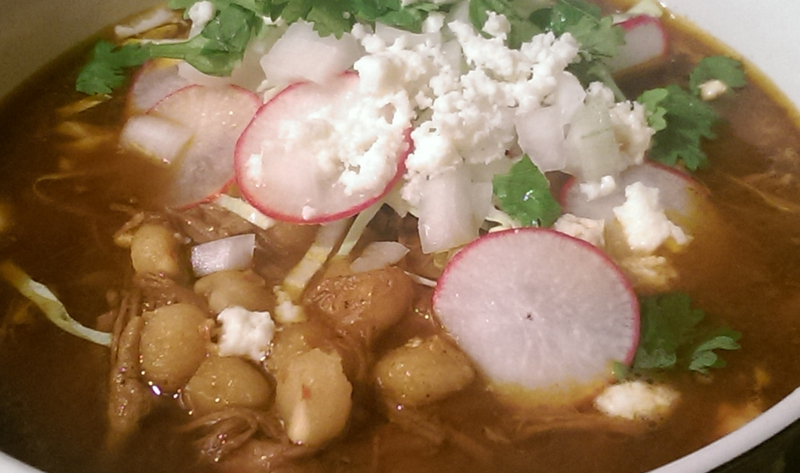 Cooking pozole involves three distinct elements. First is the broth, a slow braise to tenderize the pork that does require a bone—pork ribs, pig’s feet, smoked ham hocks or even beef stew bones can be used in addition to the meat. To this is added a salsa, a spicy sauce of dried chiles and other elements that is fried briefly in fat to concentrate and intensify its flavor. Pozole is a stew for which the finish and garnishes are as much a part of the recipe as any cooked ingredients. Make sure to have a wide variety available, traditionally including shredded cabbage, sliced radish, diced white onion, avocado, fresh cilantro, Mexican oregano, lime wedges and corn tortillas. To serve, arrange the garnishes in smaller bowls and allow diners to individually build the soup to their own tastes. 1 Roughly chop 1 onion and smash 4 cloves of garlic. Add both to 6 c water along with the pork, bay leaf, salt and peppercorns. Simmer over very low heat, covered, for about 3-4 hrs. 2 Remove the pork and set aside; shred by hand when cool. Strain the solids out of the liquid and discard, reserving the stock. 3 Remove the stems and seeds from the chiles and soak them in 2 c hot water for 30 min. 4 Add 3 cloves of garlic, ½ onion, cilantro, cumin and oregano to the rehydrated chiles and their soaking water. Purée until smooth. 5 Fry the chile blend in a little hot oil or lard for about 5-10 min. Add the reserved stock and bring to a boil. 6 Reduce the heat to a simmer and add the hominy and shredded pork. Cook uncovered until warmed through and reduced slightly, about 30 min. Season to taste.